Why Choose Citizens Community Credit Union? Citizens Community Credit Union has been serving its members since 1940. Our motto is “Everything we do, we do for you” and we mean it! Our profits are returned to our members in the form of more and better services and more favorable rates on savings and loans. Citizens has consistently been ranked in the top 10% of all financial institutions annually for safety and security by Bauer Financial, Inc., an independent rating company. To become a member and use our services, complete a short membership card and deposit $25.00 in a savings account. Please stop in at any of our office locations to open your membership. A credit union is a financial cooperative owned by the people that use it. Its foundation is “people helping people”. Our members are the heart of our credit union. These factors allow credit unions to offer lower loan rates, higher savings rates and fewer service fees. The National Credit Union Administration (NCUA) is the federal agency that charters and supervises federal credit unions. The NCUA, like the FDIC, is backed with the full faith and credit of the U.S. Government, insures up to $250,000 of your account through Citizens Community Credit Union. The NCUA insures member savings in federally insured credit unions, which account for approximately 98 percent of all credit unions. All federal credit unions and the vast majority of state-chartered credit unions are covered by NCUA insurance protection. Not one penny of insured savings has ever been lost by a member of a federally insured credit union. 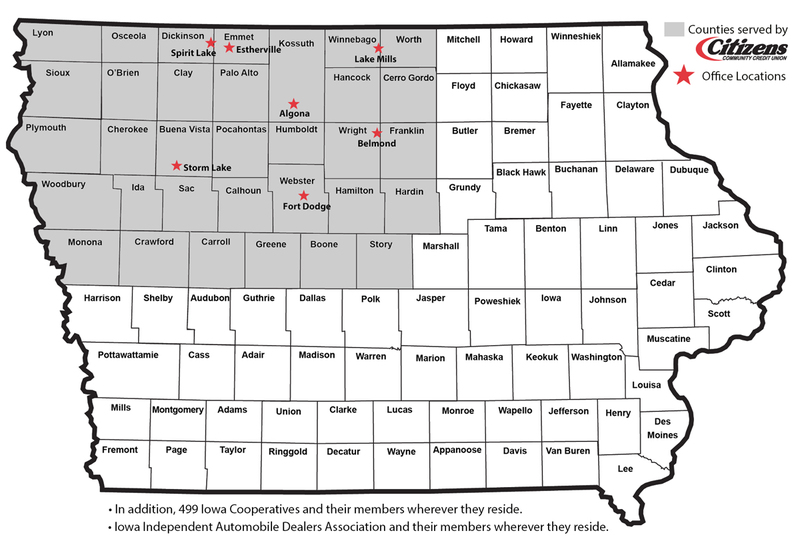 You may join Citizens Community Credit Union, if you live, work, or have a close relative who lives or works in one of the following counties in Iowa: Boone, Buena Vista, Calhoun, Carroll, Cerro Gordo, Cherokee, Clay, Crawford, Dickinson, Emmet, Franklin, Greene, Hamilton, Hancock, Hardin, Humboldt, Ida, Kossuth, Lyon, Monona, O’Brien, Osceola, Palo Alto, Plymouth, Pocahontas, Sac, Sioux, Story, Webster, Winnebago, Woodbury, Worth, Wright. To become a member and use our services, complete a short membership card and deposit $25.00 in a savings account. Please stop in at any of our office locations to open your membership.